Every mortared stone wall needs a solid foundation. If you are lucky, you can build your stone wall on a ledge. If there is no ledge where your stone wall will be built, you will need to pour a concrete footing. Do not let pouring one scare you away from building a mortared stone wall. It is not that hard. Really, it is not. Basically, you are going to dig a hole in the ground and fill it with your mix. You can handle that. 1. Layout: Determine where your mortared stone wall will be built. You need to make sure all of it will be supported by a solid concrete footing (or by a ledge). Mark the layout of the wall with stakes or spray paint. 2. How deep to dig: You need to make sure you dig below the frost line. Ask locally to determine how deep you need to dig in your area. If you pour your footing above the frost line, the ground below may freeze and heave, disrupting your wall. If you live in an area that experiences really cold winters, you may need to dig down 3 feet or more. It is a lot of work. But, you want to make sure that your stone wall does not move after it is built. It is worth the hard work. 3. Height (vertical thickness) of the concrete footing: I pour my concrete footings thick when building mortared stone walls; specifically, I make them at least 12 inches in height. If I am building a really big wall, I will pour them even thicker (taller), because the concrete footing will need to support more weight. Although you can pour concrete footings to be as short as 12 inches, sometimes I will pour additional concrete to get back up to grade level. Let me explain. Say you had to dig 3 feet deep to get below the frost line. Then you poured 12 inches of concrete. Now your wall is starting 2 feet below the ground. You will have to build 2 feet of wall just to get back to ground level. That is a lot of wasted stones and wasted labor. 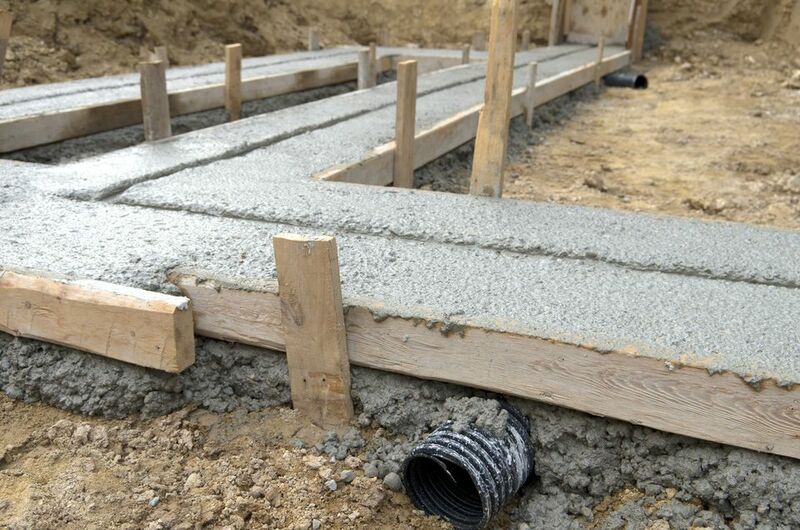 It is easier to pour the concrete footing almost to ground level. You can leave the concrete footing a few inches below grade to make sure it does not show when the wall is finished. 4. Width (horizontal thickness): Your concrete footing should be a little wider than your mortared stone wall. If your wall will be 18 inches thick, you should make your concrete footing 24 inches thick. That way, you know all of the wall will be supported, and you will have a little wiggle room in case your layout was a little off. Start digging: So, now you know where your concrete footing is going, and you know how big of a hole you need to dig. After calling the Dig Safe phone number to verify that it is safe, it is time to get to work. Make sure you put the dirt somewhere where it will not be in the way while you are building your mortared stone wall. You do not want to have to move it twice. If you have to dig a huge hole and the task is a bit too daunting, you could consider hiring someone to dig the hole for you. You can also rent digging machines that are easy and safe to use. Check with your local rental companies. Make sure that they explain how to safely use the equipment before you take it home. 6. How much concrete do you need? This is a very important question, and it is very easy to determine with some simple math. Read this article on pouring concrete for information on determining how much concrete you need for your project. You can hire a concrete company to deliver premixed concrete with a concrete truck. You can make concrete yourself using four simple ingredients. Or, you can buy bags of premixed concrete that are mixed with water. For a big concrete footing, the easiest way would be to hire a concrete truck. For smaller jobs, you can mix the concrete yourself or use the premixed bags. Determine how much concrete you need first. If you need less than a yard, you would be OK using the premixed bags. If you need 3 yards or less, you should consider mixing the concrete yourself. If you need more than 3 yards, you could mix it yourself, but it would be easier to hire a concrete truck. 8. Pouring the concrete: Pour the mixed concrete into the hole. In most cases, you will not have to pour your concrete footing to a precise measurement. Just make sure that it meets the requirements we talked about earlier. Also, be sure to keep the concrete a little below ground level, so that, when the job is over, all you will see is the stone wall. You can dump the concrete into the hole with a shovel, but be careful not to spill dirt into the hole when you do. Once the concrete is poured, use a garden hoe to pack it into place. Tap the concrete with the flat side of the hoe. This will ensure all the voids are filled and will also help to level the concrete. You can leave the surfaces of the concrete rough This will actually help you achieve a good bond with the mortar when you start building your stone wall. Of course, if you want to practice your trowel skills or impress your friends with how smooth your concrete footing is, you can run a trowel over the top of the concrete to smooth it out. 9. Curing: Congratulations. You just poured a concrete footing. In most cases, after the concrete has sat overnight, you can start building your mortared stone wall the next day. If it is really hot where you live, you will need to take extra precautions to allow the concrete to cure properly. Read this article for tips on curing concrete. If it is below 40 degrees Fahrenheit when you pour the concrete footing, you will need to keep the concrete warm. With a solid concrete footing, you are ready to build a mortared stone wall.